Currently there is a "Lot Stores" red awning in front of the building. In the 50's and 60's, my grandparents ran a chicken shop inside of it. They sold whole chickens, and from what my father says, some of the best rotisserie chicken in the city. So it also doubled somewhat as a lunch counter. No pictures exist in the family of the shop inside Niesners, and I know that'd be a longshot request, but even any pics of the store itself, or even just stories, would be gladly appreciated. As coincidence would have it, I ended up living right by there a few years back, on Spaulding. And everytime I'd walk by I'd be reminded that that is where my family started in America. My grandparents were Holocaust survivors and that was what they did after they finally got into America in about '51 and got on their feet. They are long since gone, so all I have to go on is my dad's recollections. It'd be great to get some insight/info from some others who perhaps remember the store or their chicken shop. I kind of remember Neisner's being a small 5 and 10 Cent store, but I know little about them. There used to be a Neisner's at the Winston Plaza shopping center on North Ave in Melrose Park. It was sort of a five and dime operation. When my brother and I would ride our bikes out there to go to Olson Electronics and to check out the cutout bin at the record store, we would stop in at the Neisner's lunch counter and get a meatloaf sandwich. Apparently Neisner's was a national chain. I found a article in the Tribune dated 1960 where Neisner's was announcing the opening of their 36th store in the Chicago area. I found some other ads,but they didn't appear to do any newspaper advertising other then mentioned with other stores and I could not find any ad that listed any store locations. Here is the link for their Wikipedia article which contains very little informationn other than they were bought by Ames Department stores. The other dime store chains I remember were Kresge's and Woolworths. If I remember correctly most of the store for some reason always had red signs with gold lettering. Edited 1 time(s). Last edit at 08/15/2011 11:17AM by Kchi. Thank you very much WayOutWardell for asking and inquiring, I really appreciate it. And everybody else too, thank you for your input. Hopefully one day I'll find some picture or something or other, it'd be nice. Edited 2 time(s). Last edit at 07/06/2012 03:04AM by logansquare60647. There was one on Madison and Karlov. Now it's the site of a McDonald's. You can find a picture in the book "Chicago's Jewish West Side". There was one on Devon Avenue at either Campbell or Maplewood in the '60s. I used to like it better than Woolworth's. There also was a Niesner's 5 and 10 store on North Avenue just east of Larrabee Street on the north side of the street. There was a bowling alley upstairs. I had my first date with a girl there. I bought her Cokes at the soda fountain. Other dime store chains from years ago were Ben Franklin, W.T Grant, and Newberry's. S.S. Kresges later became K-Mart! I guess today Wal-Mart has become the ultimate super dime store. 423reed,I think there also was a woolworths on the south side of north ave. between mohawk and cleveland. 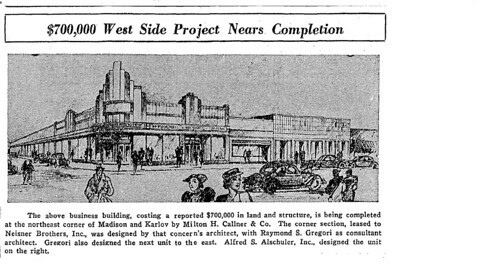 Here's an exerpt from an October 1938 Tribune article mentioning the Madison and Karlov Neisner's location. There was also a Niesner's on Archer Ave. in Brighton Park, with a lunch counter. I remember they had pretty fair utility pizza--kind of a glorified frozen John's style that my brother and I enjoyed. We also had a blast in their photo booth and frequently bought 45 records there in the mid-late '60's. Alas, all that's left of them is the tiled entryway to some crummy store I forget the name of. Interestingly, many of the old shops on Archer have been slightly preserved in the presence of their tiled thresholds (? ), which have the store names on them. Is there some sort of specialized architectural term for these things? I was 15 years old when I worked @ the Niesner's in the 1200 block of south Halsted. There was a man and his wife who had the beat chicken around. His name was Eli and his wife was Bula. Hope that helps. I was 15 years old when I worked @ the Niesner's in the 1200 block of south Halsted. There was a man and his wife who had the best chicken around. His name was Eli and his wife was Bula. Hope that helps. My name is Frank and I have been looking for anyone who was familiar with the Ol Niesners store on Halsted. I knew Eli & Bula very well. I was best friends with their son Joey. He was my best man at my wedding. Joey had a sister named Dorothy and another brother Harry. I worked at Chernin's shoes for many years and was at that Niesners every Saturday. Edited 1 time(s). Last edit at 06/18/2013 07:20AM by mrcubby. My name is Frank and I have been looking for anyone who was familiar with the Ol Niesners store on Halsted. I knew Eli & Bula very well. I was best friends with their son Joey. He was my best man at my wedding. Joey had a sister named Dorothy and another brother, Harry. I worked at Chernin's shoes for many years and was at that Niesners every Saturday. I know they were Holocaust survivor's, like my parents were. Just checking to see if you are related to them. Edited 1 time(s). Last edit at 06/18/2013 07:22AM by mrcubby. I don't know anything about the Chicago store, but I wokred at Niesner's in 1965, in Cleveland, at West 25th Street and Lorain Avenue. In the 60s my mother took me to a store on milwaukee ave south of North ave. It was on the west side of the street. It was accrose the street from Goldbatts. It was on the corner. I remember it had a wooden stairs to the sports department. On the first floor was clothing. I believe there was also a Neisner's near Grand and Harlem, on the north side of Grand, just east of Harlem Ave.
Wasn't there a Neisner's on Clark street, just north of Belmont, on the east side of the street that I seem to recall burned down in a huge fire around 1960 or 1961?